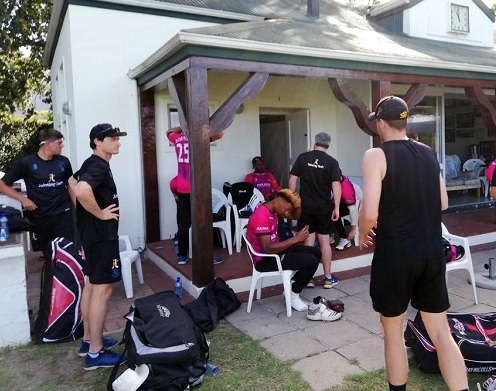 Delray Rawlins and his Sussex Cricket Club teammates will leave South Africa tomorrow with a perfect record following victory in their fourth and final match against a Western Province Invitational XI at the Vineyard Ground in Cape Town. Half-centuries for Ben Brown, Luke Wells and Luke Wright and a fine all-round performance with the ball, spearheaded by George Garton who took four wickets, helped the Sharks to a resounding 195-run win in the 40-over match. After Sussex were asked to bat first, openers Wells and Wright went on the attack from the outset. The pair put on 150 inside 17 overs, before Wright retired not out on 64. Wells fell in the next over having made 82 from 59 balls and Michael Burgess followed next ball for seven to give Seth Fledermaus, the eighth bowler used by Western Province, two wickets from his first two balls. Harry Finch and Brown then combined to add 83 for the third wicket. When the captain fell for a 37-ball 51, Sussex were 241 for three in the 29th over. Finch scored 32 and Rawlins added 4, they followed in quick succession, both caught as they looked to maintain the team’s electric scoring rate. Academy graduate Harrison Ward and Will Beer were able to keep the momentum going, however. Ward smashed 43 off 23 balls finishing his innings by taking 26 off a single over before he was caught with the score on 308. Danny Briggs chipped in with seven from four balls, including a six, leaving Beer (35*) and Jack Carson (1*) to take Sussex to 331 for eight at the end of their 40 overs. George Garton struck with the third ball of the Western Province reply, having Josh Breed caught for a duck, with the score still on naught. Garton had his second and third in his fourth over – a double wicket maiden – to reduce the hosts to 34 for three after seven overs. Wickets continued to tumble as a variety of bowlers were given a final opportunity for match practice under the Cape Town sun. Wells struck next, bowling Nooi for eight, before Beer had Justin Gilliland leg before wicket for the same score. Ward’s off-breaks brought him two wickets, the first of which accounted for the innings’ top-scorer, Kevin Vermeilen who had made 64 from 53 balls when he was stumped for 64. When Joffre Duminy was caught off Ward for 18, Western Province were nine down with the score on 130 after 29 overs. It was left to Danny Briggs to complete victory, bowling number eleven du Plessis for one with his third ball. Rawlins would finish with figures of 8-0-29-0.